Why Khau Pha Pass is special ? 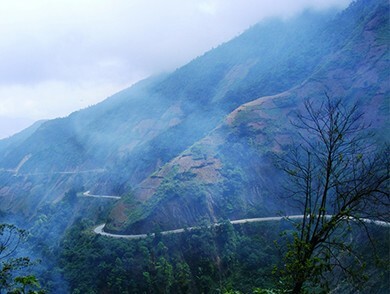 As one of the lines winding and steep gorge ranks among the best Vietnam, Khau Pha Mountain pass is in the highest mountain in Mu Cang Chai area. 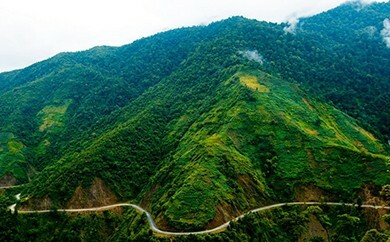 Khau Pha Pass starting point is cut Highway 32 to Highway 279 consecutive seamlessly with grand children pass it forward and pass on the road behind Kim Walls 32. With just a low concrete barrier between you and the steep mountain drop, it's best not to look down. It’s said to be one of the most dangerous roads in the country, making many people and especially foreigners eager to explore it. The road is 30km long, pretty steep. It’s dangerous due the thick fog, snow in winters, sharp bends, no barrier or warning signs, lack of regular maintenance, risk of landslides. From the city of Yen Bai, vice along Highway 32 about 5 hours, through communal Tu Le, Khau Pha pass Mu Cang Chai district out between a plateaus surrounded by mountains identical messages. The winding stretches of road passes between the old forests are bold and pristine slopes terraced fields of H’Mong, Thai.